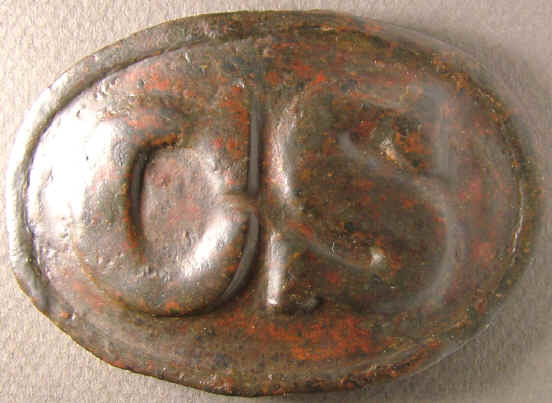 Buckle depicts "CS" and is an oval belt plate broadly used in the Confederacy. This style is noted for crudely formed letters, oval is nearly round, border is not distinct. Plate is called the "Breckinridge" style by early relic hunters because some were found in camps occupied by the famous general, however there is no evidence actually linking this to Breckinridge because they are also frequently found in Tennessee. Plate is stamped on thick sheet brass, scraps of brass were cut into hooks and soldered into place, the plate never was filled. Plate measures 59mm x 88mm approximately, plate is hand cut and edge is irregular. Ref: Mullinax Expanded Edition, Plates 148 to 150. P0659...Confederate oval belt plate, CS, "Breckinridge" style, die stamped brass, not filled, sheet brass hooks, Confederate wartime manufacture. 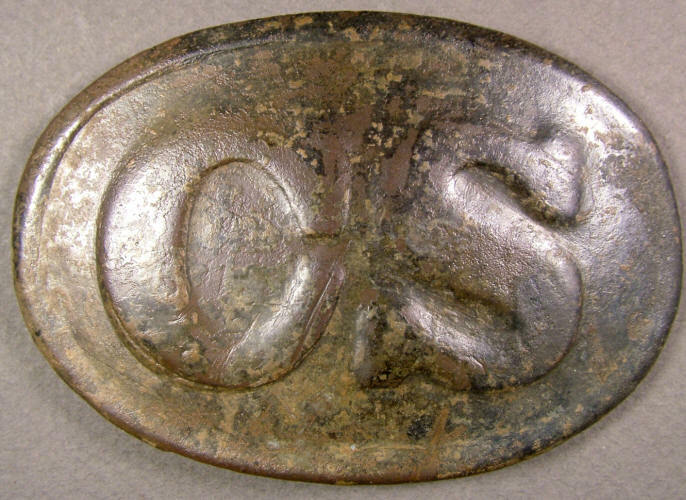 Buckle depicts "CS" and is an oval belt plate broadly used in the Confederacy. This style is noted for crudely formed letters, oval is nearly round, border is not distinct. Plate is called the "Breckinridge" style by early relic hunters because somewere found in camps occupied by the famous general, however there is no evidence actually linking this to Breckinridge because they are also frequently foundin Tennessee. Plate is stamped on thick sheet brass, scraps of brass were cut into hooks and soldered into place, the plate never was filled. Plate measures 57mm X 87mm. Dug plate, hooks intact. Recovered: Shelbyville Tennessee. P1434...Confederate oval belt plate, CS, "Breckinridge" style, die stamped brass, not filled, sheet brass hooks, Confederate wartime manufacture. Buckle depicts "CS" and is an oval belt plate broadly used in the Confederacy. This style is noted for crudely formed letters, oval is nearly round, border is not distinct. Plate is called the "Breckinridge" style by early relic hunters because somewere found in camps occupied by the famous general, however there is no evidence actually linking this to Breckinridge because they are also frequently foundin Tennessee. Plate is stamped on thick sheet brass, scraps of brass were cut into hooks and soldered into place, the plate never was filled. Measurements not obtained. Dug buckle, hooks intact. Recovered: Franklin Tennessee. P1478...Confederate oval belt plate, CS, "Breckinridge" style, die stamped brass, not filled, sheet brass hooks, Confederate wartime manufacture. Buckle depicts "CS" and is an oval belt plate broadly used in the Confederacy. This style is noted for crudely formed letters, oval is nearly round, border is not distinct. Plate is called the "Breckinridge" style by early relic hunters because somewere found in camps occupied by the famous general, however there is no evidence actually linking this to Breckinridge because they are also frequently foundin Tennessee. Plate is stamped on thick sheet brass, scraps of brass were cut into hooks and soldered into place, the plate never was filled. Measurements not obtained. 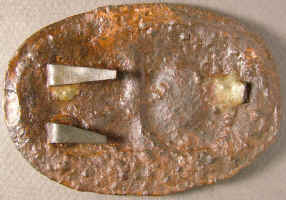 Dug buckle, hooks intact, small bend on right side has been straightened. Recovered: Columbia Tennessee, original discovery was published in the North South Trader Volume 30 No 3 2004 page 31. P1546...Confederate oval belt plate, CS, "Breckinridge" style, die stamped brass, not filled, sheet brass hooks, Confederate wartime manufacture. 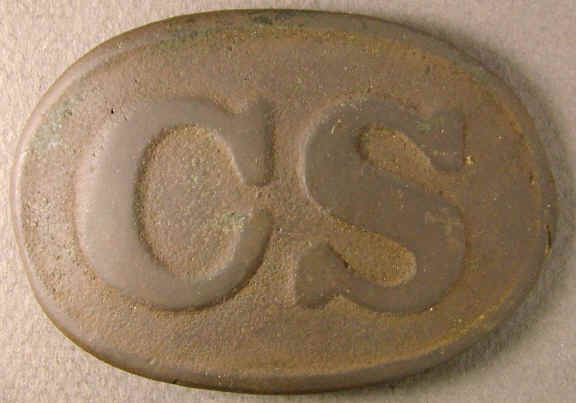 Buckle depicts "CS" and is an oval belt plate broadly used in the Confederacy. This style is noted for crudely formed letters, oval is nearly round, border is not distinct. Plate is called the "Breckinridge" style by early relic hunters because somewere found in camps occupied by the famous general, however there is no evidence actually linking this to Breckinridge because they are also frequently foundin Tennessee. Plate is stamped on thick sheet brass, scraps of brass were cut into hooks and soldered into place, the plate never was filled. Plate measures 57mm X 87mm. Dug plate, one hook missing, tongue is separated but original to this buckle, small crack near the "S" is reinforced and stable. Recovered: Tennessee campaign. P1674...Confederate oval belt plate, CS, "Breckinridge" style, die stamped brass, not filled, sheet brass hooks, Confederate wartime manufacture. 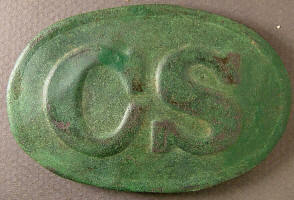 Buckle depicts "CS" and is an oval belt plate broadly used in the Confederacy. This style is noted for crudely formed letters, oval is nearly round, border is not distinct. Plate is called the "Breckinridge" style by early relic hunters because somewere found in camps occupied by the famous general, however there is no evidence actually linking this to Breckinridge because they are also frequently foundin Tennessee. Plate is stamped on thick sheet brass, scraps of brass were cut into hooks and soldered into place, the plate never was filled. Measurements not obtained. Dug plate, apparently there is a small crack above the C that has been filled and reinforced. Recovered: Franklin Tennessee, Lotz house collection. Buckle depicts "CS" and is an oval belt plate broadly used in the Confederacy. This style is noted for crudely formed letters, oval is nearly round, border is not distinct. 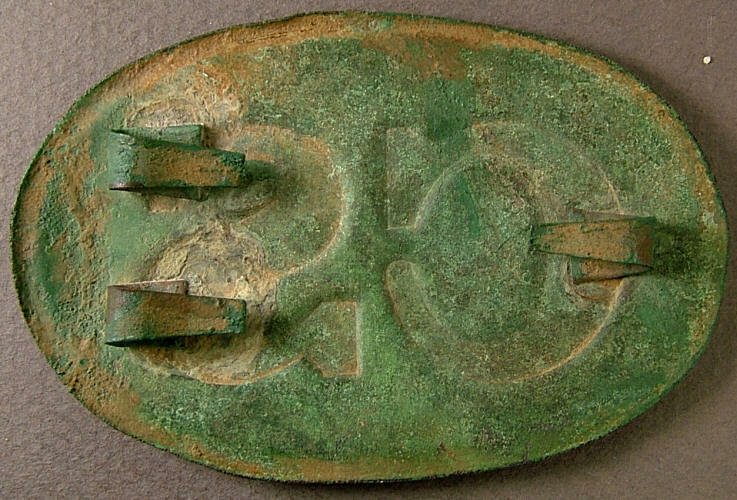 Plate is called the "Breckinridge" style by early relic hunters because some were found in camps occupied by the famous general, however there is no evidence actually linking this to Breckinridge because they are also frequently found in Tennessee. Plate is stamped on thick sheet brass, scraps of brass were cut into hooks and soldered into place, the plate never was filled. Plate measures 59mm x 88mm approximately, plate is hand cut and edge is irregular. 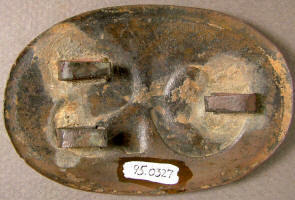 Dug plate, all three hooks present, one was reapplied. Recovered Tennessee campaign. 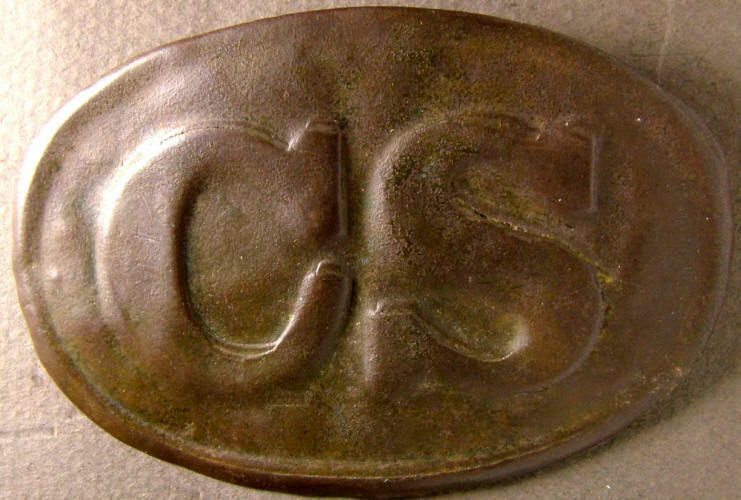 Buckle depicts "CS" and is an oval belt plate broadly used in the Confederacy. This style is noted for crudely formed letters, oval is nearly round, border is not distinct. 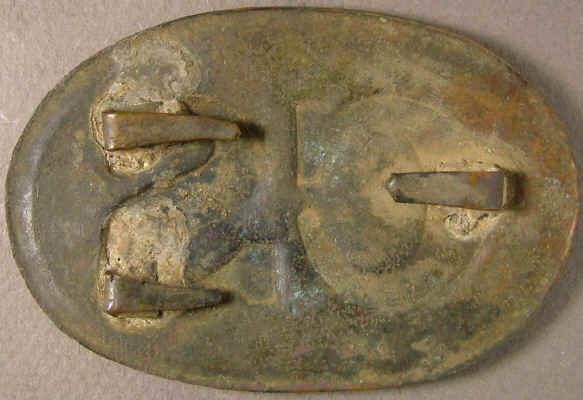 Plate is called the "Breckinridge" style by early relic hunters because some were found in camps occupied by the famous general, however there is no evidence actually linking this to Breckinridge because they are also frequently found in Tennessee. Plate is stamped on thick sheet brass, scraps of brass were cut into hooks and soldered into place, the plate never was filled. Plate measures 59mm x 88mm approximately, plate is hand cut and edge is irregular. Dug plate, hooks intact, bend in middle was straightened. Recovered: Mufreesboro Tennessee. Confederate oval belt plate, CS, "Breckinridge" style, die stamped iron, not filled, sheet brass hooks, Confederate wartime manufacture. Buckle depicts "CS" and is an oval belt plate broadly used in the Confederacy. This style is noted for crudely formed letters, oval is nearly round, border is not distinct. Plate is called the "Breckinridge" style by early relic hunters because somewere found in camps occupied by the famous general, however there is no evidence actually linking this to Breckinridge because they are also frequently foundin Tennessee. Plate is stamped on thick sheet iron, scraps of brass were cut into hooks and soldered into place, the plate never was filled. Ref: Mullinax Expanded Edition, Plate 152. P0371...Confederate oval belt plate, CS, "Breckinridge" style, die stamped iron, not filled, sheet brass hooks, Confederate wartime manufacture. Buckle depicts "CS" and is an oval belt plate broadly used in the Confederacy. This style is noted for crudely formed letters, oval is nearly round, border is not distinct. Plate is called the "Breckinridge" style by early relic hunters because somewere found in camps occupied by the famous general, however there is no evidence actually linking this to Breckinridge because they are also frequently foundin Tennessee. Plate is stamped on thick sheet iron, scraps of brass were cut into hooks and soldered into place, the plate never was filled. Plate measures 59mm X 87mm (plates hand cut). Dug plate, this one has been clear painted to prevent further deterioration, one hook missing. Recovered: Atlanta campaign. 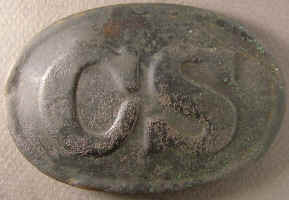 Buckle depicts "CS" and is an oval belt plate broadly used in the Confederacy. This style is noted for crudely formed letters, oval is nearly round, border is not distinct. Plate is called the "Breckinridge" style by early relic hunters because somewere found in camps occupied by the famous general, however there is no evidence actually linking this to Breckinridge because they are also frequently foundin Tennessee. Plate is cast, probably copied from a stamped version, the hooks are very long and narrow and were cast straight and then bent. Ref: Mullinax Expanded Edition, Plates 154 to 155. 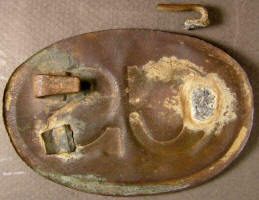 P0319...Confederate oval belt plate, CS, "Breckinridge" style, cast, integral hooks, Confederate wartime manufacture. 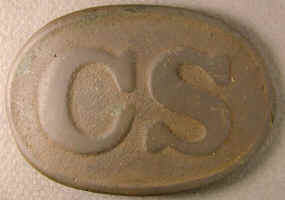 Buckle depicts "CS" and is an oval belt plate broadly used in the Confederacy. This style is noted for crudely formed letters, oval is nearly round, border is not distinct. Plate is called the "Breckinridge" style by early relic hunters because somewere found in camps occupied by the famous general, however there is no evidence actually linking this to Breckinridge because they are also frequently foundin Tennessee. 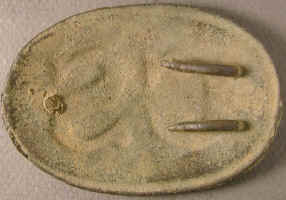 Plate is cast, probably copied from a stamped version, the hooks are very long and narrow and were cast straight and then bent. Plate measures 54.4mm X 80.3mm. Dug plate, tongue is broken. Recovered: Lovejoy GA by Don Odom, original discovery was published NST Vol X, No 2, January - February 1983, pg. 4.